M17 is one of the treasures of Sagittarius. 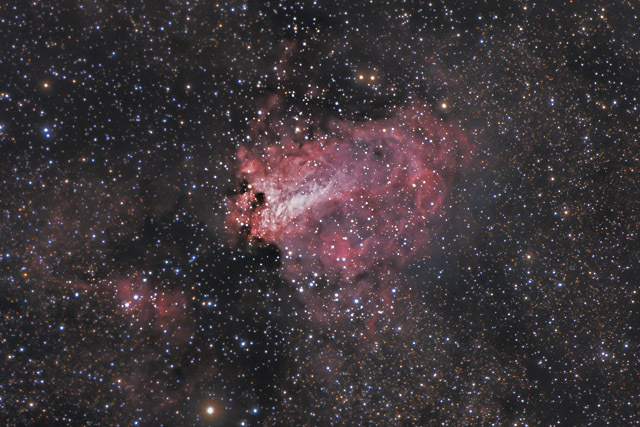 Commonly called the Omega Nebula, it also known as the Swan Nebula (because it looks like a swan) as well as the Checkmark Nebula, and the Lobster Nebula. The red hydrogen gas in the region is illuminated by the massive embedded star cluster, NGC 6618. M17 is also the second brightest radio source in the sky. In this image, North is Down. This image shows 97% of the original field of view. Software Used Images Plus 4.5 for camera control, calibration, stacking, digital development, multiresolution sharpening, smoothing and noise reduction. Registar used for aligning stacks. Photoshop CS5 used for levels and curves, color correction, selective color, high pass filter, star shrinking, lab color, saturation adjustments, screen mask invert, lens correction, and smart sharpen. Gradient Xterminator for gradient removal. Carboni Tools for additional saturation adjustments, noise reduction, and smoothing. HLVG for additional color correction. Notes I had photographed M17 last year and had a pretty good result. However, I wanted to try it again, as my new camera works much better and I've developed better capture techniques. With this image, I ended up creating a mosaic as well as blended images focused for different parts of the image. The net result is that I have an image that is rather sharp across the entire field of view of the camera. I am quite happy with the improvement over last year's image.